Seeing Differently is an engagement tool co-​designed in a close-​nit collaboration between Leapfrog and the Newbold Trust – a small social enterprise committed to sustainability in the beautiful North East of Scotland. They went through a process of renewal and they wanted to involve local communities in the renewal of their facilities, as well as in the re-​shaping of their identity. 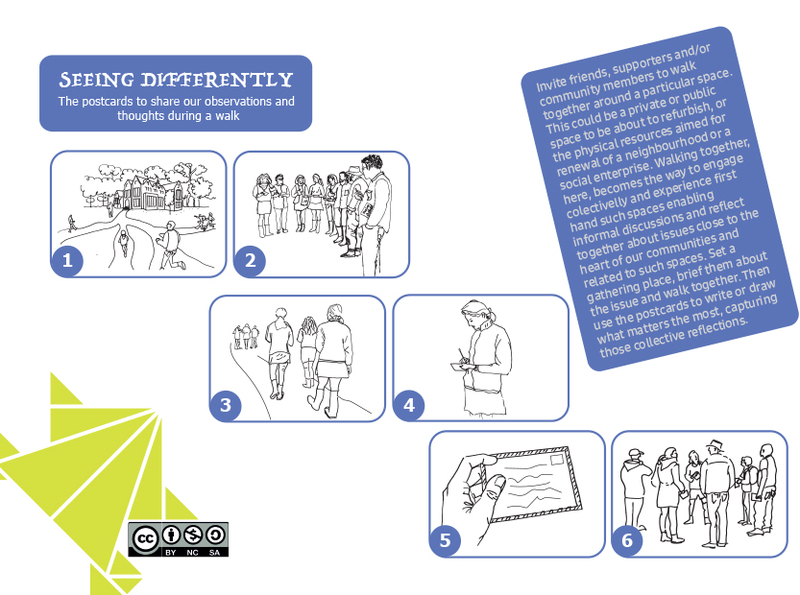 After a series of workshops, where walking became the vehicle to engage with several communities, the tool was conceived to capture the insights of the participants of a deliberative walk. A deliberative walk is “a participatory process in which the participants, by deliberating in small groups and joining facilitated walks, tackle a complex policy issue that has highly intertwined social and physical dimensions” (Ehrström, 2016: 6). Here, it refers to a community engagement method where we invite the participants to discover and experience first hand the physical realm aimed for renewal, which shapes the physical support for developing social sustainability. The facilitated walk aims to create the space for collective reflection about issues where social and physical dimensions converge. Walking becomes the vehicle to engage with the participants setting an informal and relaxing atmosphere. By discussing in small groups, we seek to capture the participants’ reflections and insights during the walk. The walk helps us to seeing differently. Ehrström, Peter (2016, September) Reflections on Deliberative Walks – A Participatory Method and Learning Process. Paper presented at ESREA: 8th Triennial European Research Conference. Imagining diverse futures for adult education: questions of power and resources of creativity, Maynooth University, Ireland.